I don’t watch a lot of television—the news and weather, NCIS, and Elementary. At least two are mysteries. The weather is usally a mystery, and the news—well, to be a real mystery, you need clues, and most newscasters are clueless. Elementary, BBC’s Sherlock Holmes, and House, MD are all essentially the same genre with the same skeletal structure. The hero is a brilliant man, addicted to opioids, who is able to quickly solve mysteries, but only takes on cases that interest him. His roommate is a doctor who served in Afghanistan, but was wounded. Dr. Watson is an intelligent and educated man, but is amazed at Holmes’s powers of deduction. 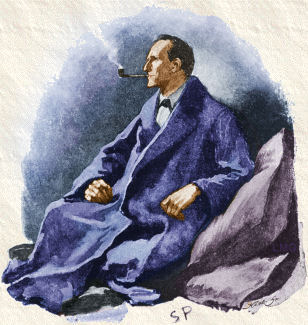 Holmes originally appeared in installments as a column, to use the modern vernacular, in The Strand, a monthly magazine. Having written monthly articles, I can understand Conan-Doyle’s fascination, and the dread of dealing with recurring deadlines. He eventually tried killing Holmes off—plunging to his death over a waterfall along with his arch-rival Moriarty—but the public wouldn’t stand for it. With a lame excuse of Jiu-Jitsu, Homes reappeared, to Conan-Doyle’s displeasure, but the approval of the readers who didn’t care HOW Holmes escaped–just that he did. As a writer, I’m intrigued by such circumstance: a great lead character, a narrator who’s also part of the story, and an ensemble from poor Inspector Lestrade to Holmes’s smarter brother, Mycroft. And, yes, “The Woman,” Irene Adler. I was going to write more, but instead I’m going to go and re-read The Adventures of Sherlock Holmes yet again. This entry was posted in Actor, Arts, Culture, Fiction, History, Media, People, Philosophy, Technology, Writing and tagged Conan-Doyle, Doyle, Holmes, Sherlock, watson. Bookmark the permalink.